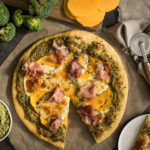 Definitely better than take-out, this yummy pizza is packed with Italian flavours and veggies. Broccoli Pesto: Preheat oven to 425˚F (220˚C). In large pot of boiling salted water, cook broccoli for 2 to 4 minutes or until tender; drain well and let cool to room temperature. In food processor, purée broccoli, basil, garlic, walnuts, Parmesan, oil, lemon zest, lemon juice, salt, pepper and hot pepper flakes until smooth. Pizza: Cut butternut squash into 1/8-inch (3 mm) thick rounds. On lightly floured surface, roll out pizza dough into 12-inch (30 cm) round, about 1/4-inch (5 mm) thick. Transfer to floured pizza pan. Spread pesto over dough, leaving 1/2-inch (1 cm) border all around. Top with mozzarella, squash and sage. Bake for 20 to 25 minutes or until golden brown, bubbly and squash is tender. Let stand for 2 minutes before slicing. Arrange prosciutto over pizza. Use a mandolin slicer or food processor to thinly slice butternut squash. Use regular, whole wheat or spelt pizza dough. Substitute pine nuts or pecans for walnuts if desired.